ob, ensuring without fail the satisfaction of thousands of buyers, and the ones making their Pyrkon debut made such a great first impression that the prospect of a future cooperation fills us with excitement. We hope that you enjoyed this year’s edition as much as we did, and that you count down the days to the next one with as much anticipation as we do. 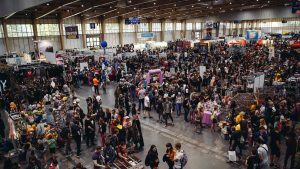 Applications for next year’s Pyrkon will open in autumn. If you have any questions please write at vendors@pyrkon.com.